UPDATE 9/4/13: This giveaway is now closed! The winner (chosen by random.org) is comment 214, LR! Congrats LR! Please email me at kitchenconcoctions at gmail dot com to claim your prize. Thank you to all those who entered! NOTE: Winner must contact Kitchen Concoctions within 72 hours at kitchenconcoctions at gmail dot com to claim prize. If winner has not claimed prize within 72 hours then a new winner will be notified. According to the giveaway guidelines chosen winner must have set up a free Cooking Planit account. Contest open to US only. Limit one-winner per household/per family from the 50 blogs participating in the promotion. If an individual is the winner of more than one giveaway, they will receive only one set of cookware and an alternate winner will be chosen for the other set(s). This information will be verified by the contest sponsor, Cooking Planit. Kitchen Concoctions is not responsible for unclaimed, undelivered or damaged prizes. Remember last week I teased you about a giveaway for a set of T-fal Cookware (brought to you by T-fal and Cooking Planit)?? Well today is the day!! 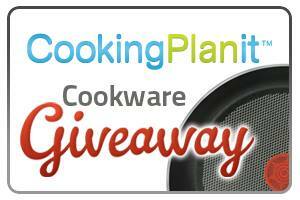 I’ve teamed up with Cooking Planit again to bring you another fabulous giveaway! This time we are working with the awesome cookware company, T-Fal to giveaway a 12-piece set of T-Fal cookware! Let me tell you how impressed I am with this set of cookware and I can’t wait for you to have a chance to win your own set! This giveaway is made possible with the sponsors T-fal and Cooking Planit. Cooking Planit is an iphone/ipad app and website that is a meal planning and recipe guide. This app takes you step by step through the process of preparing an entire meal from start to finish. I like that it makes meal planning easy and effortless by providing suggestions for full meals and walks you through when to start the side dish while working on the main dish at the same time. It takes out all the guess work of when to start what and have dinner all ready at the same time! If you would like you can read my original review of the app and website by clicking here. This giveaway is unique and in that you have 50 opportunities to try and win! 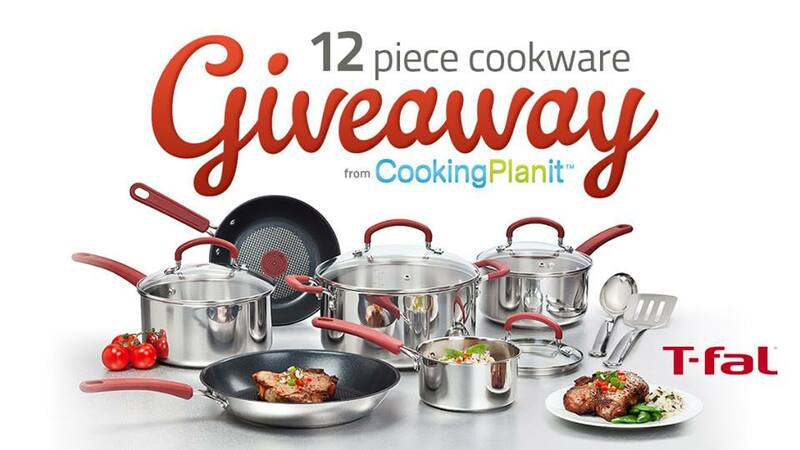 The Cooking Planit/T-Fal Cookware Giveaway is an unbelievable promotion. They’re giving 50 sets of cookware to foodie, mommy and tech bloggers to give away to their readers, and two sets will be given away each day for 25 days with the first contests starting on August 19. My contest begins TODAY, Sunday, August 25! All throughout this week I will be sharing more information about this cookware as well as recipes from the Cooking Planit website (and reminding you to enter the giveaway!). 1. Set up a FREE Cooking Planit account online or via iPhone or iPad apps. Once you have done this please leave a comment below. 3. “Like” Kitchen Concoctions on Facebook. 4. Follow Kitchen Concoctions on Twitter. 5. Follow Kitchen Concoctions on Pinterest. 6. Follow Kitchen Concoctions on Instagram @kitchenconcoctions. 8. “Like” Cooking Planit on Facebook OR “Follow” Cooking Planit on Twitter. 9. “Like” T-fal on Facebook OR “Follow” T-fal on Twitter. DETAILS: Contests open to US only. Limit one-winner per household/per family from the 50 blogs participating in the promotion. If an individual is the winner of more than one giveaway, they will receive only one set of cookware and an alternate winner will be chosen for the other set(s). This give-away closes Sunday, August 31, 2013 at 11:59 PM CST. One winner will be chosen at random (by random.org) and will be announced sometime shortly after the give-away ends. Winner must contact Kitchen Concoctions within 72 hours at kitchenconcoctions at gmail dot com to claim prize. If winner has not claimed prize within 72 hours then a new winner will be notified. Kitchen Concoctions is not responsible for unclaimed prizes and will choose another winner if original winner has not claimed prize within 72 hours of being announced. Giveaway for US residents only. Kitchen Concoctions is not responsible for undelivered or damaged prizes. Contents of prize pack may vary slightly. Do you want more chances to win? Well check out the other 49 blogs participating in this giveaway and enter there too! With Cupcakes and Kale Chips specifically starting her giveaway today too! For more information about T-fal Stainless Steel with Thermo-spot 12-Piece Cookware Set and Cooking Planit check out the links below! And check out Cooking Planit! Disclosure: This giveaway is sponsored by Cooking Planit and T-Fal. I was provided a cookware set for participation as well as one to giveaway. Images courtesy of Cooking Planit. I liked Kitchen Concoctions on FB! I set up a Cooking Plaint account. I signed up for a Cooking Planit account! I follow T-Fal on Twitter. I liked Cooking Planit on FB! I follow Kitchen Concoctions on Twitter. I follow Kitchen Concoctions on Pinterest. I follow Kitchen Concoctions on Twitter! I have set up a Cooking Planit account. I follow Kitchen Concoctions on Twitter (@PJGurganus). I've "liked" Kitchen Concoctions on Facebook (Pam Krick Gurganus). I followed Kitchen Concoctions on Pinterest (Pam Gurganus). I follow Kitchen Concoctions on Instagram (pjgurganus). I've "liked" Cooking Planit on Facebook (Pam Krick Gurganus). I've "liked" T-fal on Facebook (Pam Krick Gurganus). I followed Kitchen Concoctions on Pinterest. I liked Cooking Planit on Facebook and followed Cooking Planit on Twitter. I liked T-fal on Facebook and followed T-fal on Twitter. I like Cooking Planit on Facebook and Twitter! I like T-Fal on FB and I follow them on Twitter. I set up a cooking planit acct. thanks. I follow cooking planit on FB and twitter. I follow Tfal on FB and twitter. I sign up for the NEW Kitchen Concoctions newsletter. I set up a cooking planit account. I liked kitchenconcoctions on facebook. I liked cooking planit on facebook and followed on twitter. I liked Tfal on facebook. I like Cooking Planit on Facebook. I signed up for the cooking Planit App – woohoo! I have set up a FREE Cooking Planit account online. I "Follow" Cooking Planit on Twitter. I "Follow" T-fal on Twitter. I am signed up at Cooking Planit online. I like Kitchen Concoctions on FB. I follow you on Pinterest (jodoobers). I'm signed up for Kitchen Concoctions newsletter. I like Cooking Planit on FB. I like T-fal on FB. I've signed up for Cooking Planit account. I “Like” Kitchen Concoctions on Facebook where I am Margot Core. I follow Kitchen Concoctions on Twitter where I am @AnnaZed. I follow Kitchen Concoctions on Pinterest where I am Margot Core. I follow Kitchen Concoctions on Instagram (@kitchenconcoctions) where I am @margotcore. I "Like" Cooking Planit on Facebook where I am Margot Core. I "Like" T-fal on Facebook where I am Margot Core. I signed up for Kitchen Concoctions Newsletter aswell! I have a cooking plait account! I set up an account on Cooking Planit. I followed Kitchen Concoctions on Twitter. I signed up for the NEW Kitchen Concoctions newsletter. I liked Cooking Planit on Facebook. I liked T-Fal on Facebook. I “Like” Kitchen Concoctions on Facebook. Liked Kitchen Concoctions on Facebook. Following Kitchen Concoctions on Pinterest. Created a cooking planit account. Did everything (FB, Twitter, Pinterest, CP acct, etc) except Instagram, 'cos I'm not on Instagram. @crepuscle (twitter), tekflower @ FB, Pinterest, & Hotmail. I'm loving all the food blogs I'm finding through this contest, yours included. I set up a FREE Cooking Planit account. I like T-fal on Facebook. I have a Cooking PlanIt account under starbe4132 at aol dot com. I follow you on Pinterest as Heather! Schaffer. I follow you on Instagram as hybroanglid. I LIKE Cooking PlanIt on Facebook! I follow Cookin PlanIt on Twitter as hybroanglid. I have a cooking plantit account. like kitchen concoctions on fb. I "Like" Cooking Planit on Facebook. I "Like" T-fal on Facebook. Set up a FREE Cooking Planit account online. I set up a Cooking Plait account! I like Kitchen Concotions on Facebook! I set-up a Cooking Planit account online. I like kitchen concoctions on Facebook! I like tfal on facebook and follow on twitter! I like cooking planit on facebook and follow on twitter! I signed up for a Cooking Planit account. I followed your blog on twitter. I followed/liked Cooking Planit on twitter and Facebook. I followed/liked T-Fal on twitter and Facebook. I opened an account under sbroughton61@yahoo.com for cooking planit. I signed up for a Cooking Planit account under yona(at)pricelesswriters.com email. I made a Cooking Planit account. Liked Kitchen Concoctions on Facebook as Austin Baroudi. Following Kitchen Concoctions on Pinterest as Austin Baroudi. Signed up for the NEW Kitchen Concoctions newsletter. Liked Cooking Planit on Facebook as Austin Baroudi. Liked T-fal on Facebook as Austin Baroudi. I have created a Cooking PlanIt account. I have liked Kitchen Concoctions on facebook. I have liked Cooking PlanIt on facebook. I have liked T-fal on facebook. I set up an account online! I follow Kitchen Concoctions on pinerest! I "Like" Cooking Planit on Facebook! I "Like" T-fal on Facebook! I like Kitchen Connections on FAcebook. Follow Kitchen Concoctions on Pinterest. Follow Kitchen Concoctions on Instagram @kitchenconcoctions.